Nothing can compare to the excitement of knowing that you are bringing a new life into this world. But for some bringing a new life into a home with a dog already in residence can cause stress. The unknowns of whether the family pet and the baby will both be able to live in harmony can cause a lot of problems. But this does not need to be the case. You can prepare your beloved dog for the new arrival. The advice in this article is great for families who are having their very first baby or ones that are adding to their already growing house hold. In February of 2004 I was full of excitement. My dream of owning my first purebred White Shepherd was about to be realized. Sheena was 8 weeks old and arrived 2 days before Valentines Day. So I saw her as my Valentines Day present. But a couple of weeks later I learned that she wasn’t my only Valentines present. That’s right, I found out I was pregnant. I was unbelievably excited. For some the thought of being pregnant and having a puppy at the same time might seem difficult. Not for me. I had a plan. Along with her basic training and her Service Dog training I was going to prepare her for the baby’s arrival. The first thing I did was get a recording of the different sounds a baby makes. From crying, to giggling. I would play it at various times of the day just to get her used to the sounds. This way the new sounds of the baby would not be such a shock. One of the things I thought would be handy was also to teach her to alert me to the baby crying. The reason being sometimes baby monitors just don’t work, but dogs ears always do. I taught her to paw at me when she would hear the crying sound. This came in very handy during my sons first month of life where he could not make any sounds. Even though I could not hear him Sheena could and would do as trained and alerted me to when he was awake and crying in his crib. The way I taught the pawing was when I would play the sound I would take her paw and put it on my leg and then reward her with a ball toss(she is ball trained) a treat would work as well. Doing this repeatedly taught her to do this when ever she heard the sound. The next thing I did was to get the baby’s room ready. Once it was ready I taught her that whenever we were in that room she was to lay under the crib. This way she was out from underfoot but could still be with us. To train for this I placed a blanket under the crib and attached a leash as a tether to a piece of furniture(this will end up not being needed). I would then say Place and put her under the crib, then I would read for a while in the rocking chair while she relaxed under the crib. I did this twice a day every day till she saw it as her nap time. Then I got out the stroller and first got her used to just being around it. I set it up in the living room and just let her walk around it and get used to it. Then I started to take her for short walks with the stroller. As she got used to how to behave with the stroller I took her for longer and longer walks. The last thing I did was to get a very life like baby doll. I trained her that when the baby was on the floor she was in her place. The way I taught this was to have a blanket in a spot in the room that was her spot. I had a leash attached to a piece of furniture to tether her to that spot(the leash will end up not being needed). Then I would say Place tether her to the spot and then give her a chew toy. When the baby was in my arms she could play but no jumping on the furniture and no jumping on me. With the use of the baby doll I got her used to me carrying around a baby and that I could not always focus on her. 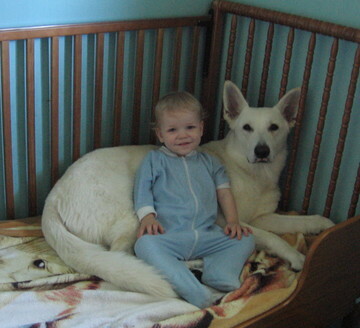 Bringing a baby into a family with a dog need not be stressful. Our bodies give us nine months to not only prepare ourselves but also prepare the entire family for the new and wonderful life. Doing these things made it so there was no stress in bringing our new son home. Give it a try. It will be well worth it.